Though often discussed as if it were a single type of spirit, baijiu is a tree with many branches. 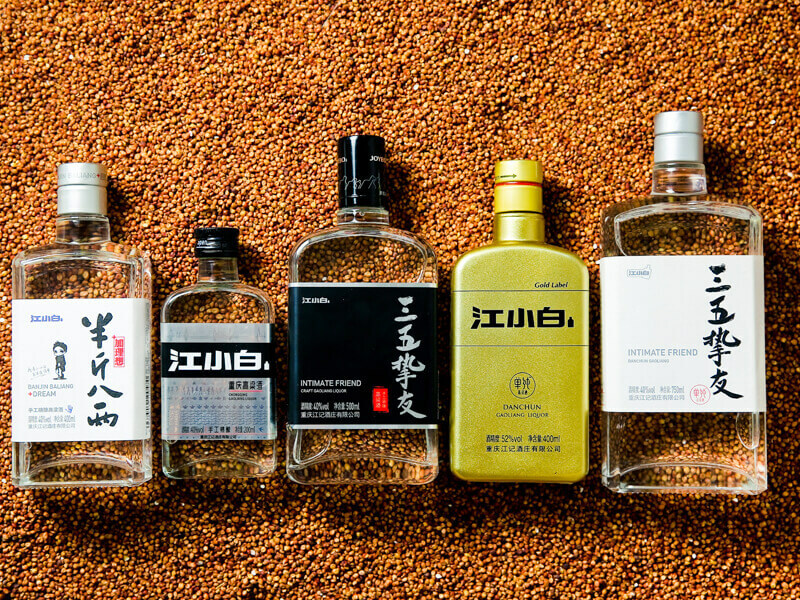 In terms of ingredients, production methods and flavors, baijiu can be worlds apart. The current classification system is a modern innovation and not without its limitations, but it is a useful reference point for any drinker. Before we get into the baijiu classification, it is very much necessary to know what is Qu. It is the key to turn grains into alcohol, is sometimes incorrectly translated as brewer’s yeast, but contains much more than just yeast. Winemakers produce Qu by crushing moistened grains into a paste, forming them into clumps and continuously adjusting their moisture level in a controlled environment. By the end of the process the clumps have drawn yeast, bacteria and other microorganisms from the air, which coat the surface and interior of the grain clumps. Qu can create subtle differences in taste and recipes are the most carefully guarded secrets in the industry. Easily the most popular and widely produced category of baijiu in China, strong-aroma baijiu is fermented in earthen pits. There are two variations of strong-aroma baijiu: single grain (danliang 单粮) and mixed grain (zaliang 杂粮)，respectively distilled from one or more grain. In taste, strong aroma is fiery with a fruity sweetness. Strong aroma has intimate regional ties to Sichuan in the southwest, China’s largest alcohol producing province, as well as the eastern provinces of Anhui, Jiangsu and Shandong. The second-biggest category by volume, light-aroma baijiu is distilled from sorghum and rice husks fermented in ceramic jars. Light-aroma baijiu is fermented with Big Qu made from barley and peas, and typically has a mild floral sweetness. It is commonly associated with northern China. Another hybrid, Xiao-Qu baijiu (also Xiao-Qu light-aroma baijiu) is primarily distilled from sorghum and fermented in pots with rice Qu. It retains light aroma’s mild floral character, but also contains some of the mellowness of rice aroma. Sause-aroma baijiu derives its name from its distinct and lingering fragrance, which is said to resemble soy sauce. It is a mellow spirit, with a layered taste of herbs and fermented beans, and a long aftertaste. Sauce-aroma production is labour and resource intensive, involving multiple fermentation in subterranean pits lined with stone bricks. The category is most closely associated with southeastern Sichuan and northwestern Guizhou. Rice-aroma baijiu is most closely related to huangjiu in its production methods. It is distilled from long-grain rice, glutinous rice or a combination of the two and fermented with small rice Qu, often containing Chinese medicinal herbs. Rice-aroma baijiu is aged in limestone caves, and often infused with fruits, herbs, tea flowers or TCM. At its best, rice aroma is smooth and mild, resembling Japanese sake in taste. Rice baijiu is produced throughout southern China, but is most closely linked to Guangxi and Guangdong provinces in the southeast. Named after Xifengjiu, ‘West Phoenix Spirit’, from Fengxiang Country, Shanxi Province, phoenix aroma combines aspects of the strong and light aroma categories. It is distilled primarily from sorghum fermented in earthen pits with a wheat, barley and pea based Qu. Unlike strong-aroma baijiu, phoenix-aroma producers replace the mud lining its fermentation pits each year and employ a short ten-day fermentation period. Following distillation, phoenix-aroma baijiu is aged in the ‘seas of alcohol’: giant rattan baskets filled with cloth sacks hardened with vegetable oil, beeswax and pig’s blood. These baijius are notable for their fruity aromas, grainy tastes and expanding finishes. Mixed aroma is less a distinct category than a combination of categories. A mixed-aroma baijiu is produced by combining production techniques or blends from two different baijiu categories. The most common mixed aromas are hybrids of strong and sauce aromas, either of which may play the predominant role. Invented in Guangdong Province in 1895, chi aroma’s name refers to douchi, a salty Chinese condiment made from fermented beans. Chi aroma is indistinguishable from rice-aroma baijiu in all respects save one: It is aged with an infusion of pork fat. Accordingly, this variety is sometimes called fat aroma (zhi xiang 脂香) and has an oily body with subtle bacon overtones. The sesame aroma baijiu is first made in 1957. It is made primarily from sorghum with wheat Qu, and also sometimes millet and barley. Fermentation is carried out in a stone-lined pit with a mud bottom, developing distinct flavour depending on depth and position in the pit. Sesame aroma is a close relative of sauce-aroma baijiu but is fermented at higher temperatures for a shorter amount of time, and thus has a more charred, nutty flavour. Using a sorghum base, the alcohol is fermented in two pits, the larger pit performs fermentation using Big Qu and the smaller pit uses rice Qu filled with high-alkaline white mud mixed with wild peach juice and sealed with coal. After extraction from the pit, the two mashes are mixed together and distilled. Medicine aroma is a layered liquor that marries sweet and savoury flavour. It is distilled from sorghum and glutinous rice fermented with Big Qu and small medicinal Qu, and aged for at least three years. It has a pungent earthy fragrance and a spicy-sweet taste. According to master blender Madame Wu Xiaoping, who coined the categoty’s name, mixed-aroma baijius combine aspects of two baijiu categories, while extra-strong aroma combines at least three. Special aroma is fermented from rice and Big Qu in pits of red bricks joined with cement and sealed with mud. Its fragrance is earthy, but its taste is light with a rich, slightly tart aftertaste. It is similar to light-aroma baijiu in almost every respect but uses wheat instead of barley and peas to make its u. It is also aged for a shorter period of time than light-aroma, typically no more than six months. Usually bottled at over 65% ABV, it has a fruity flavour overshadowed by a searing alcoholic flame. Special THANK YOU to Mr. Derek Sandhaus, who is the author of BAIJIU The Essential Guide to Chinese Spirits, most part of this article is cited from this brilliant and enlightening booklet about Chinese baijiu.